Remember how I determined to purge books last week? Well, I got two boxes and one bag out the door. Whew! Yes, I’m proud of myself. Yes, I feel better. And I’ve got that Empty Shelf for this years books. You know, one good thing about sorting through something? You find little treasure you’d forgotten about. I found a whole stack of books I purchased long ago (college days), but never got around to reading. Those poor books have been moved from Lansing to Grand Rapids, from apartment to house to house to house…well, let’s just say, they’ve been around. One of those books? Kurt Vonnegut’s Slaughter-House Five. Now, don’t go around saying I’m recommending this book. I’m not. It isn’t for everybody. It’s…well…it’s different. Good old Vonnegut wrote with “gallows humor”. So, there’s that. He also blended Sci-Fi with humanism with war stories with F-bombs. So, there’s that too. His book won’t be next to an Amish Romance in your favorite Christian book store. Yeah, that’s a good way to say it. Vonnegut was, true story, a prisoner of war during World War II. He was in an underground meat locker while Dresden was bombed. He survived a horrific ordeal. 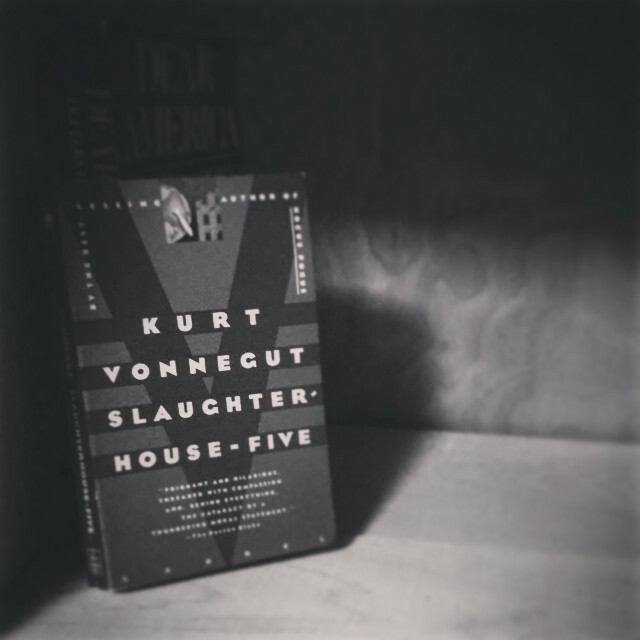 Slaughter-House Five is his fictional retelling of that terrifying experience. Light weekend reading, huh? Well, maybe not. Lately, I’ve read a lot about war. I have a pile of books I still need to go through, all about one specific war. War is ugly. It makes little sense to me. It is heartbreaking. It is anything but glorious. All of those were reflected in Vonnegut’s writing. Here is something from the novel that has truly stuck with me. There’s nothing that can be said that can make sense of war. That’s something I’m learning lately. So, what are you reading? What books have you read that are sticking with you? Why do they stay in your head? Read anything that made you scratch your head and say, “what in the world was that all about?”? It makes me a bit sad that you don’t share my fervent love for Vonnegut’s writings. I agree that he’s not everyone’s cup of tea, but for me you couldn’t find a teacup big enough for his stuff. So it goes. I’m glad that you read Slaughterhouse Five. Everyone should at least once. Good luck with continuing to write hard topics.